Description: CSXT 7515 & 7653 are seen on Q386-04 at Rockwood, PA. 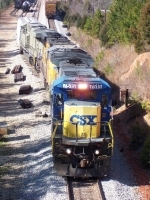 Description: CSX C40-8 7515 in the yard at Manchester, Ga with another GE locomotive. Exact date of photo unknown. Description: Passing through at 5:06 PM. Description: A former conrail GE leads this train north towards walbridge and then onto detroit. Description: Glowing like little red beady eyes, 7498's marker light lead the way. Description: The 349 Milepost sign on the right is for the "West Shore Branch"
Description: A tired-looking B36 leads this train into downtown Birmingham. Description: CSX 7725 & 7515 pull a mixed merchandise through St. Denis toward Baltimore.